Two years back, when I reached Uncle Sam's country, I was really nervous just like anybody who lands in a new place.I knew there won't be many Indians in the place we were going to live. For the same reason, I thought there won't be any Indian groceries either. It was a great relief when I saw spinach on our first trip to the grocery store. Like a flash of lightning this idea struck, "Why not make spinach thoran instead of cheera thoran". I love my Amma's cheera thoran and I learned from her how to make them without any lumps. If this dish tastes good the credit is my mom's, but the idea to substitute spinach for cheera, I can proudly say is my own. I shared this idea with a couple of my Mallu friends and they are to date extremely happy about it. I hope you will have the same experience and be happy with this authentic amma's recipe with a twist. Always when you make a thoran with leaves , wash and dry the leaves completely before cutting. 1. Wash the spinach and spread it on a paper, at least 1hour before you cut them.This is very important, since if you have water on spinach you will end up having lumps in your thoran. 2.Cut the leaves into smaller pieces. 3. Grind(not much-maybe for a couple of seconds) coconut and green chillies together. If you do not have a grinder/small bowl for your mixer grinder, leave this step and just add more green chillies slit into halves. 4.Heat oil in a pan and splutter mustard seeds followed by rice. 5.Add sliced shallots and saute it till golden brown. 6.To this add red chillies and curry leaves and saute . 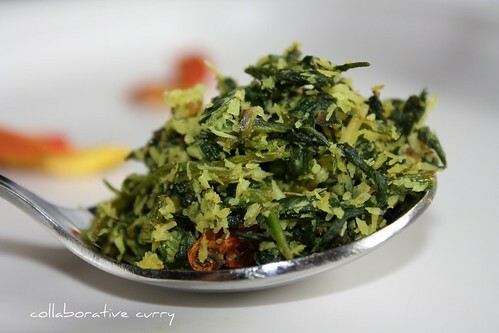 7.Mix spinach with turmeric, salt and coconut mix from step 3 and add into the pan. 8.Mix everything together and cover the pan. 9.Cook on medium flame for about a minute or till the steam comes.Don't keep the lid for long, since the steam will accumulate ,which in turn end up in lumps. 10.Open the pan and cook till the thoran is done by stirring in between. This is a very simple yet nutritious dish. This goes well with pulissery/ moru(buttermilk) curry and rice. You could use the normal "cheera" instead of spinach and also scramble eggs while giving tadka(spluttring mustard) and mix it, if you like eggs. I din't know about drying the leaves to keep the lumps from forming, thank you da great tip. I think we should all try this,its not just good for you but looks yummy!! Nami, this dish looks delicious! I have started loving spinach and had a diff version of the same today n yesterday! Will deftly try this. Spinach thoran looks really interesting. Spinach thoran looks yummy Namitha!! 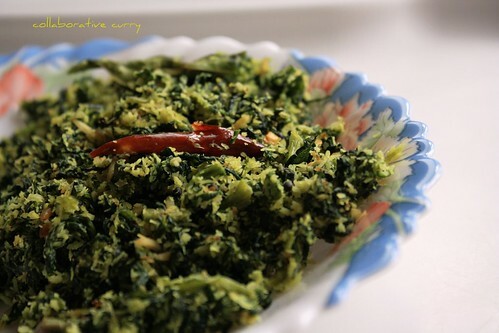 will try this recipe for sure, and thank you for telling the secret behind a dry spinach thoran ! Hi what is the yellow thing in the picture ?